Humans have been eating popcorn for at least 5,600 years, if not longer. I was surprised when I found that little fact, as I knew some of my own ancestors had been eating it for several hundred years and that they had introduced it to the settlers when they arrived, but I had no idea one of my favorite snacks was quite that old. In ancient tombs in Peru, archeologists found kernals of popcorn that were preserved so well throughout time that they were still capable of being popped! Popcorn is a whole grain fiber and is roughage, meaning that it helps to keep you regular. Popcorn has more iron than eggs, roast beef, codfish or milk. So, eating a few handfuls of popcorn can be just as good as drinking a glass of milk or having a roast beef sandwich, especially if you are trying to increase your protein intake. Popcorn provides your body with calcium, not as much as you’d get from milk, but still since many of us are trying to increase our calcium intake, and it’s good to know that popcorn has this important healthy item. Popcorn is high in vitamins: thiamine, riboflavin and niacin,as well as, all of the B Complex vitamins. All of which the body needs since our bodies do not produce vitamins on their own, and we have to supply it with them. Popcorn provides protein. Since we all know that increasing our intake of protein is one way to help us build muscle then knowing that eating popcorn can help us with that is a great thing. Popcorn is low in calories. 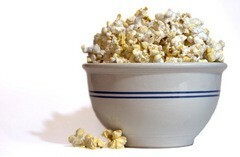 One cup of unbuttered popcorn is only 25 to 55 calories per cup making it a dieter’s dream! Next up… some healthy popcorn recipes that won’t make you feel guilty about eating popcorn that tastes great!